Registration starts in just four days! To help you have a seamless registration process, here are a few tips to help you out. 1. 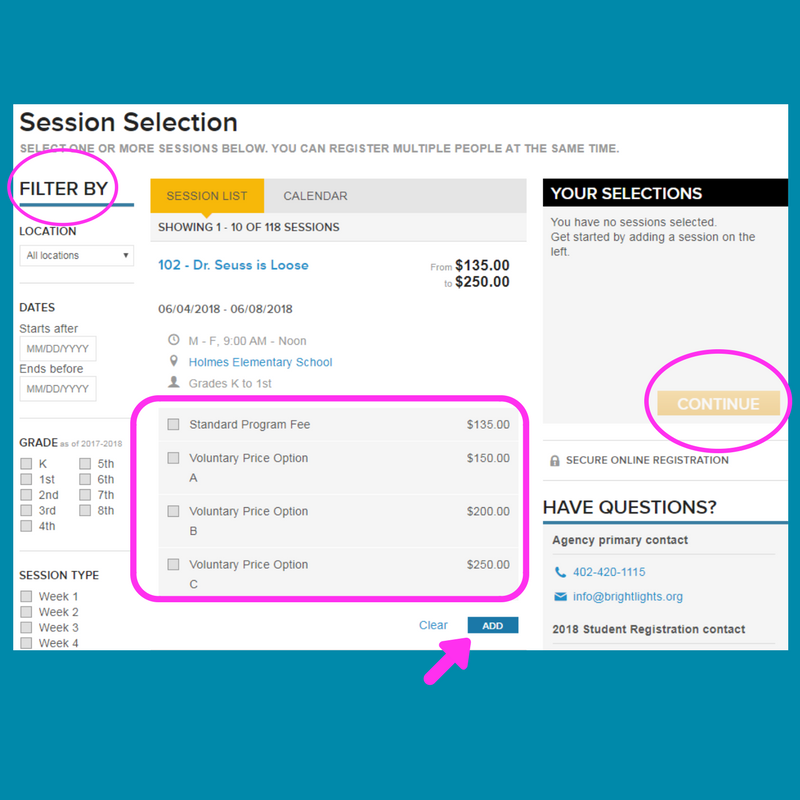 When registration opens at 8 AM, you can click on the orange “Register” button at BrightLights.org (you will not see the button until registration opens). 2. Use the filters on the left side of the form to help you narrow down your results based on your student(s) current grade as well as the week(s) they want to attend Bright Lights. You can choose as many grades and session types (i.e. weeks) as you want at one time. Doing this will prevent any classes that do not meet your criteria from showing up. 4. You will want to select all of the classes for all of the students that you are registering at the same time. Doing this will ensure that the classes are saved in your cart until you are ready to check out. 5. Once you have selected all of your classes and confirmed that they are correct, you will click on the “Continue” button on the right side of the page. 6. From here, you will follow the on-screen steps which will assign a student to each class you chose. 7. As you go through the registration questions for each student, please be aware that some of the buttons may already be selected if you registered for classes last year. Because of this, please make sure that Lunch Care or Before Care has the options that you want for this year and that you also review our policies. What should you do before registration opens on Saturday? Take a look back at our previous blog post for tips on that, including a list of things you will want to have handy as you register on Saturday. If you have additional questions about the registration process, please email registrations@brightlights.org or call 402.420.1115 ext. 45. We are looking forward to another great summer!